Founded by Boris Eifman in 1977 as the New Ballet of Leningrad, Eifman Ballet of St. Petersburg has revolutionized the concept of classical dance in Russia by taking the art of ballet to its highest level of expressiveness. Eifman created a new type of dance artists, dancers / actors, who use the solid foundation of impeccable classical ballet training as a launching pad for innovative, modern choreography. The choreographer’s unique style fuses avant-garde dance with the methods of the 20th century dramatic theatre and film, using all aspects of theatrical production to create a rich and multi-dimensional theatre experience. Shortly after being formed, Eifman Ballet began touring in Russia, performing to sold-out houses of audiences hungry for original artistic expression. Despite the pressure for Eifman to leave the country for not making “Soviet art”, the Company stayed in St. Petersburg and continued to perform to tremendous popular acclaim. Unable to tour internationally during the first 10 years of its existence for political reasons, Eifman Ballet instantly became known internationally in 1988 after its first performance abroad at the Champs-Elysees Theatre in Paris. The success of that performance has sent Eifman Ballet on tours throughout Western and Eastern Europe, Japan, South Korea, Honk Kong, Singapore, South Africa, Latin America. Sharply contrasted against the strict conventions of classical ballet set by famous Russian ballet troupes like Bolshoi and Kirov (Mariinsky), Eifman Ballet electrified the New York audiences with its vibrant, often shocking and always original style in 1998. Hailed by critics worldwide as one of the most significant contributors to today’s culture of ballet arts, Eifman Ballet continues to constantly reinvent the art form. Responding to the enormous success of its first three seasons in New York, the company began annual U.S. tours in 2000. 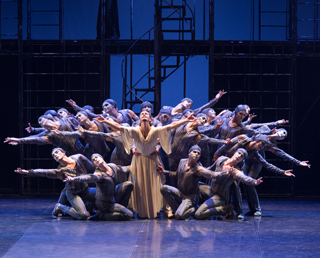 In 1999, Eifman Ballet joined only three other dance companies in the status of a constituent company of City Center, becoming the first non-American company to receive this honour. Kirov (Marrinsky) Ballet and the Bolshoi Ballet. The Eifman Ballet has over 40 ballets in its huge repertoire.